After the independence, Greece attempted to incorporate all areas inhabited by Greeks and the definitive borders with the neighbouring countries were stabilized only in the mid-1920s. According to the book Hellenic flags [k7k97], a white flag with a blue cross is known to have been used by forces connected with the Kolokotronis family, as well as the Cypriot forces of Hadjigeorgios. It was also used by the forces of Mellissinos Makarios after (perhaps during) the 1769 revolution. This probably does not exhaust its usage. As such, it was perhaps the most widely used Greek revolutionary flag. According to the book Hellenic flags [k7k97], the war ensign used in 1821, shown in the National History Museum of Athens, is horizontally divided white-blue-white. According to the book Hellenic flags [k7k97], a flag used by the Greek guerillas against the Ottoman occupation during the independence war, shown in the National History Museum of Athens, is horizontally divided yellow-blue-white, with a white cross in the middle of the blue stripe, flanked by two green branches. The revolutionary motto "ΕΛΕΥΘΕΡΙΑ Η ΘΑΝΑΤΟΣ" (Freedom or Death, the main motto of this war and the current national motto of Greece), is horizontally written, in black, in the lower part of the flag. Athanasios Diakos (1788-1821) was a Greek fighter and national hero. According to the book Hellenic flags [k7k97], Diakos' standard is white with St. George slayering the dragon. 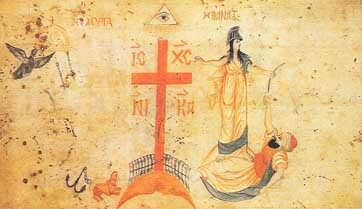 According to the book Hellenic flags [k7k97], Andreas Londos flew on 21 March 1821 a red flag with a black Latin cross resting on a white crescent, with horns down. The reverse of this flag is reported as plain red. There was apparently also a crescent-less variant. Nikitaras (Nikitas Stamelopoulos, 1782-1849) was born at Leontari, in Arcadia, the son of a poor peasant farmer. He was a nephew of Kolokotronis and he, too, served in the army of the Ionian Islands. In 1821 he became head of a band of pallikars. He fought Kiaya Bey at Kaki Scala and in March and April 1822, at Ayia Marina, Nikitas fought successfully under the leadership of Odysseus against Dramali, who was threatening Thermopylae. After Dramali's invasion of the Morea, Nikitas took up a position commanding the narrow passes on his route back to Corinth. There the Greeks inflicted a terrible defeat on the enemy, killing 3,000 Turks. The result of this battle won for him the nickname of Tourkophagos. At the siege of Mesolongi, Nikitas gave further proof of his pure and selfless patriotism. The sailors bringing reinforcements to the besieged town demanded payment in advance. But there was no money. Then Nikitas flung down his sword, a priceless weapon which he had won from a high-ranking Turk, and cried out, "All I have is this sword. I offer it to my country!" His fine example had an immediate effect. All present stepped forward eagerly to donate whatever they could afford. Nikitaras' standard is shown in the National History Museum in Athens. Papaflesas (Grigorios Diskalos) was born at Messinia in 1788. In his teens he became a monk. The Turks, knowing his revolutionary character forced him to leave Greece. At Constantinople, where he went, became one of the key members of Filiki Etairia. Under Ypsilanti's orders he returned to Peloponneses and started preaching the ideal of freedom, preparing so the people for the revolution. He was a key figure of the Greek Revolution. When in 1825 Ibrahim landed with thousands of Turkish army in Peloponneses, Papaflesas leading 2,000 men marched against him. During the battle which took place at a place called Maniaki, on 20 May 1825, Ibrahim with 6,000 Turks attacked and killed 600 Greeks and their leader Papaflesas, who fought bravely to the bitter end. According to the book Hellenic flags [k7k97], Papaflessas' standard is blue with a white cross. Dimitris Plapoutas (1786-1865) was a Greek general wo joined in 1818 the Philiki Etairia movement. According to the book Hellenic flags [k7k97], Plapoutas' standard is white with a blue Greek cross in the middle. In the corners of the cross are the blue letters "Ι Χ Ν Κ", for "Jesus Christ Victorious". Georgios Sisinis (1769-1831) fought in Peloponnese during the War of Independence; subsequently, he was elected President of the Second and Third National Assemblies. According to the book Hellenic flags [k7k97], Sisinis' standard, shown in the National History Museum of Athens, is white with the emblem of the Philiki Etairia movement. According to the book Hellenic flags [k7k97], Ypsilantis' flag is horizontally divided red-white-black. Red stands for the imperial purple robe and the self-government of the Greek people; white stands for innocence of the just cause of the Greek struggle against tyranny; and black represents the death of the Greeks for country and freedom. The obverse of the flag shows St. Constantine (Emperor Constantine the Great) and his mother St. Helena, flanked by the words, in black "ΕΝ ΤΟΥΤΟ / ΝΙΚΑ" ("In this sign / thou shall conquest").